Level 4-mm is the seventh level of Spooky House in Mario vs. Donkey Kong. The high score for this level is 10000. The level opens with a cinematic showing Mario leading the group of Mini Marios past a Thwomp. 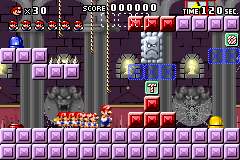 First, the player has to climb up the ropes above them, which can be reached by jumping off of the Mini Marios or the red stairs, to reach the blue Color Switch on the left. Once it is pressed, the player needs to return to the start of the level and press the red Color Switch once the Thwomp is above the upper red platforms. Jumping across the red stairs will allow the Mini Marios to collect the letter T. The player then has to press the yellow Color Switch, lead the Mini Marios past the next Thwomp, and then use the Springboard to get to the platform above. With the Mini Marios on the center platform, the player needs to jump onto the platform with the blue Color Switch and lead the Mini Marios in the letter Y. After making the Thwomp fall, the player needs to press the blue Color Switch and return to the ladders and Springboards on the right, and have the Mini Marios jump onto the platform above. Then the player needs to move right without pressing the other Color Switches and Handstand Jump onto the platform with the toy box, leading the Mini Marios into the letter O. The player should then return to the Springboard, use it and have the Mini Marios jump back up to the platform, press the red Color Switch, and jump across to the toy box. Collecting it will start the next level. This page was last edited on April 14, 2019, at 15:49.